As August wanes summer weather remains firmly in place over Central Massachusetts. This week’s Saturday Night menu features an aversion to heating up the kitchen anymore than necessary and an opportunity to make sure of the bounty of summer produce. Plus we celebrated G’s 8th birthday with cake. In my ongoing quest to find ways to use zucchini I decided to make some zucchini pancakes this past week. My dad used to make something like these during the summer when I was growing up. They were particularly good with a little Romesco. Rinse zucchini, halve across the middle and grate on the large holes of a box grater. Sprinkle with kosher salt (maybe a 1/2 tsp.) and place in a strainer set over a bowl. Allow liquid to drain for at least 30 minutes. Transfer drained zucchini to a double layer of paper towels, blot dry and move to a fresh bowl. While the zucchini rests you can also grate the shallot on the small holes of a box grater and add to the strainer with the zucchini. Then combine the flour and spices in a small bowl and whisk to combine. Finally lightly beat the egg to combine the yolk and white. 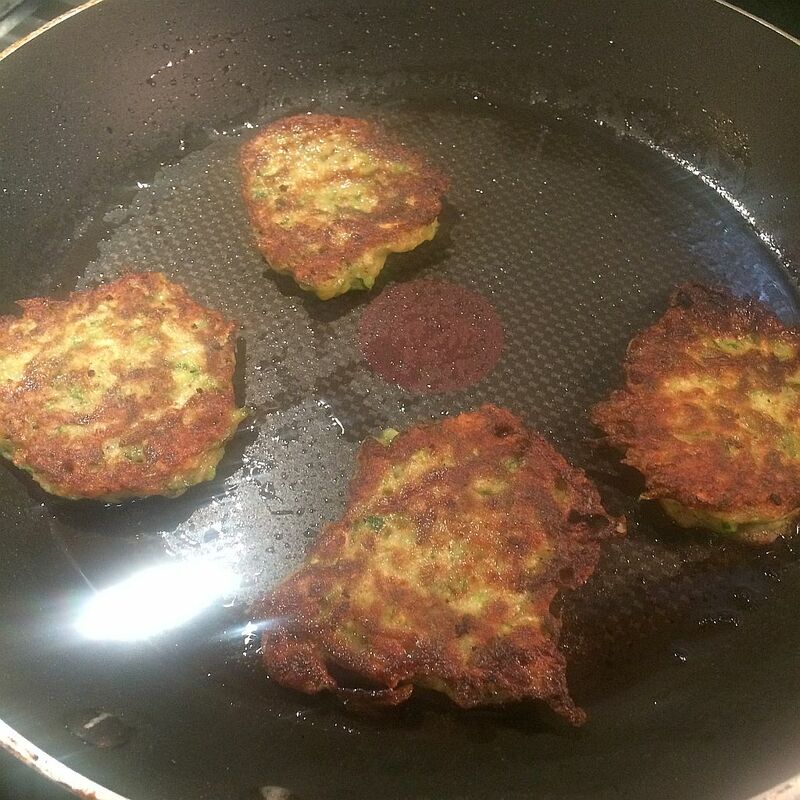 When ready to continue mix the zucchini/shallot with the flour/spices and egg until it comes together as a batter. There’s still plenty of liquid in the zucchini to supplant the egg. Heat 1 tablespoon of butter in a non-stick skillet over medium heat until it no longer bubbles. Add 4 pancakes to the skillet (I used a disher), flattening each so they are about 3″ in diameter. Cook for 2-3 minutes on the first side, flip and cook for 2-3 minutes on the second side. Both sides should end up golden brown. Transfer pancakes to a platter and sprinkle with a bit more salt. Repeat the pancake cooking process with the remaining butter and batter. Serve warm. These could also make a tasty appetizer. Just make smaller pancakes, say 1 1/2″ diameter, and top them with a dollop of sour cream plus some finely chopped chive or caviar. How do you plan a summer menu when you don’t know whether you’ll have access to the grill? First, you always have access to the grill if you are willing to ignore the water falling from the sky. Second, you can always use an indoor cooking method if water is your nemesis. Missed one so here’s a back-fill post. Cooked coarse-ground corn meal, whether you call it polenta or grits, is tasty stuff. It is can be served just after cooking or allowed gel into a flavorful brick that can be grilled, pan seared or deep fried. It is infinitely alterable just be swapping out an ingredient or two. Polenta does require supervision and a fair bit of stirring. The results are worth the effort. Bring the water to a boil in a saucepan. Crush the dried thyme between your finger tips and it, along with the salt, to the water. Allow the salt to dissolve then sprinkle the cornmeal over the water, stirring frequently. Reduce heat to a simmer and cook for 20 minutes. I stir for about 10-15 seconds out of every minute for the first 15 minutes and then constantly for the last 5. Turn off the heat and add the butter, cheese, and pepper. Stir until the butter has melted and incorporated. Taste, adjust salt and pepper as desired. Serve with the savory topping of your choice (mine is often shrimp). Polenta solidifies fairly quickly, creating a solid that can be sliced. It can be served cold or pan-seared before serving. Coat the inside of a loaf pan with non-stick cooking spray and transfer the hot, cooked polenta into the pan. Press plastic wrap onto the top of the polenta to keep it from drying out and allow it to cool for at least 1 hour, or overnight. To prep it for cooking just remove the plastic wrap, slide a knife around the edges of the polenta loaf and upturn it onto a cutting board. Slice into 1/2″-3/4″ rounds and fry in a non-stick skillet for 2-3 minutes per side. For decades I have made hard-boiled eggs the same way. Eggs in cold water, place on burner, bring to a boil, turn off burner, set timer to 20, no, 15, no, 13 minutes, cool quickly with running water, try to remove shells. Some eggs came out fine, most were a bit pock-marked where shell stuck. Often an egg was mangled badly enough that I couldn’t use it for deviled eggs. So often that I regularly cooked an extra egg. I read/heard/saw a test of hard-boiled egg cooking methods and steam followed by an ice bath was deemed to provide the easiest removed shells. I gave it a try and I’m a convert. 9 eggs cooked; 9 eggs easily shelled. Place the steamer basket in a large saucepan. Add water so that the bottom of the steamer basket is just above the water. Cover and place over high heat. When the water comes to a boil carefully add the eggs and recover. Reduce the heat to medium-low; you want to maintain steam but you don’t need a vigorous boil for that. Set a timer for 13 minutes and walk away. About a minute before the timer goes off place the ice in a large bowl and add 3 cups of cold water to create an ice bath. When the timer goes off use a pot holder or tongs to lift the steamer basket. Slide the eggs into the ice bath. Set the timer for 15 minutes and walk away. Crack the eggs against a hard surface and peel away the shell. Enjoy with a little sea salt or use for deviled eggs. You could even get fancy by making Beet Pickled Deviled Eggs. I think the credit goes to America’s Test Kitchen though whether it was in a magazine, one of their TV shows or on the radio I don’t know.